When visiting my friend Barry in London recently I felt the city to be endless, chaotic, noisy, and I frequently got lost–in the streets, with their constantly changing names and directions, and the Underground with its cute ones—and had to resort to very expensive taxis to get back to Lambolle Road, not Lambolle “Place,” “Square,” “Mews,” etc., where Barry lived and I was staying. 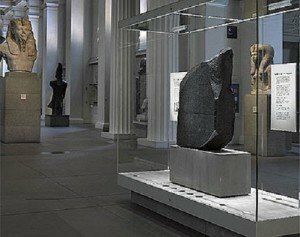 In order to calm my metabolism and get bearings, I spent an afternoon in the British Museum, and after a couple of hours there I decided I wanted to live there. One of my favorite exhibits was the Enlightenment Room where thirty-foot ceiling-high glassed-in bookshelves contained books, bones, stuffed birds and small mammals, emu eggs, etchings of the solar system and its discoverers, their tools, insect collections, embalmed fish, notes written by various gentleman natural historians, more books, multivolume encyclopedia, all of this displayed in a British let’s-just-throw-it-all-together manner and punctuated with larger than life naked Greek marble statues none of which seemed to have penises. One read the whole thing, object and text, text and object, thing and description, fact and conjecture, etc. and talked to oneself in an interesting new vernacular while watching other visitors, many of them teenagers, moving up close to the glassed-in displays, and collecting details of the organized chaos with their hand held devices. The entire Enlightenment seemed to disappear into these digital tools; it reappeared briefly on the palm-sized screens, then disappeared again in a single motion when the Handys, (which is what the Germans call cell- and iPhones) were shut down and stored away in pockets and handbags. Luckily the Rosetta stone, as replica, then as itself, was across the hallway from the Enlightenment Room door. I saw the replica—“copy”—first, took it to be the real deal, felt grounded in a past, awed by a presenece, was surprised to see the museum tour guide of the group to which I attached myself lean against and stroke the man-high monolith as if it were a large cultural pet. The visitor crowd shouldered in, introduced their personal media to the ancient ciphers, glyphs, auditory signs, then stored their doubled or even tripled knowledge away for personal posterity in pockets and purses. When the guide led us across another hallway and the real Rosetta Stone came into view, and our guide, with the hint of a sparkle in his eye, revealed this new circumstance and possible encounter to us, I felt stupid for not having expected such a theatrical introductory flourish, possible ruse, in an English museum containing one of western civilization’s most precious holders of wisdom. The true stone’s surface was a bit darker than its faked double, and the guide did not lean against or caress any of the engraved memory. On the way back to Barry’s “place” “road,” “street,” “square,” “avenue,” “alley,” etc. I looked at my guide to the underground and felt it to be a great web whose details and extensions, intentions and accomplishments, institutions and happenstance developments, would never be fully revealed to me.